The latest National Climate Assessment has just been released (National here means the USA, if you want the UK Climate Projections you can get them here). It’s already proved somewhat controversial, mainly because of a headline figure that following a high-emission pathway could reduce GDP by 10%. The reason it’s controversial – as shown by the figure on the right – is that the 10% reduction in GDP is associated with a very high level of global warming (15F ~ 8C). This result comes from this paper. As I understand it they used a broad range of climate models to generate a large number of spatiotemporal realisations of temperature and precipitation. The probability of each realisation was then based on the distribution of 21st-century global surface temperature changes being consistent with what is expected. Therefore, their distribution of results for each RCP is consistent with expectations, but 8C (15F) of warming by 2100 is still on the tail of this distribution. It’s not impossible, but is highly unlikely. It’s essentially a tail risk, and this was not made clear in the coverage. We conclude that a global-mean warming of roughly 7 °C would create small zones where metabolic heat dissipation would for the first time become impossible, calling into question their suitability for human habitation. A warming of 11–12 °C would expand these zones to encompass most of today’s human population. To be clear, I’m not suggesting that this level of warming is likely; it isn’t, even under a high emission scenario. The issue, in my view, is an economic analysis that still returns a reasonably low impact on GDP, despite warming that would lead to parts of the planet becomining potentially uninhabitable. My understanding (and I’m happy to be corrected if it’s wrong) is that these economic analysis don’t actually self-consistently model the economic systems. What they do is develop empirical estimates for how various economic sectors respond to changes in temperature and precipitation. They then use this to develop damage functions that can be used to estimate the economic response to various future climate pathways. The problem is that these are essentially linear perturbation models that are, in some cases, being applied to very large perturbations. It’s not clear that this is a reasonable thing to do. In many physical systems it very definitely would not be; in many physical systems, a sufficiently large perturbation will produce shocks that can’t be modelled using linear perturbation theory. I am always reluctant to be too critical of scientific analyses in fields outside my own, since it’s very likely that there are things I don’t understand. However, we are talking about a level of warming well beyond what Kevin Anderson would describe as incompatible with organised global community. Similarly, John Schellnhuber is quoted as saying the difference between two and four degrees is human civilisation. So, if serious climate scientists think that the impacts of 4C of warming would be quite dire, why should we have any confidence in economic analyses that suggest that even 8C of warming will have a relatively small impact? It would be great, however, if someone could provide a strong argument as to why these estimate are robust. On the other hand, it’s my understanding that there is quite a lot of debate about exactly this issue amongst economists, and others who work in this general area. Possibly, one way to think of this is that it’s mainly a way of estimating a potential carbon tax. If this is too low, or too high, then future estimates will take this into account and it can be suitably adjusted. On the other hand, if we regard these estimates as indicating that the economic impact will be minimal – even from extreme levels of warming – and we do nothing, we can’t go back and adjust what we do if this conclusion is wrong. There are benefits to acting now, rather than later. Opportunities for advances in climate change economics (Burker et al., Nature, 352, 292-293, 2016). The structure of economic modeling of the potential impacts of climate change: grafting gross underestimation of risk onto already narrow science models (Nicholas Stern, Journal of Economic Literature, 51, 838-859, 2013). Stochastic integrated assessment of climate tipping points indicates the need for strict climate policy (Lontzek et al., Nature Climate Change, 5, 441-444, 2015). This entry was posted in Carbon tax, Climate change, economics, Policy, Science and tagged 10%, Climate economics, Climate models, Hsiang et al., National Climate Assessment, NCA. Bookmark the permalink. 71 Responses to 10% of GDP? Warming of 10C will also unleash Mothra. Achievement of the global goal of RCP 8.5 will take heroic efforts, as it has been invalidated by events on the ground, but perhaps we can resurrect a shadow RCP 8.4999 to scare the kiddies in its place. Perhaps you fail to take into account that adaptation and mitigation costs contribute to GDP growth. Maybe you should try reading my posts before commenting. Worth a shot? I just recommended this place to a climate economist here promising the civilised debate, I have come to expect here. Maybe we can start again? Of course. Would be good to get the views of a climate economist. Okay, to respond more seriously to Tom’s comment, my post is not arguing that RCP8.5 is likely (I don’t think it is, but I don’t think we can yet regard it as implausible). 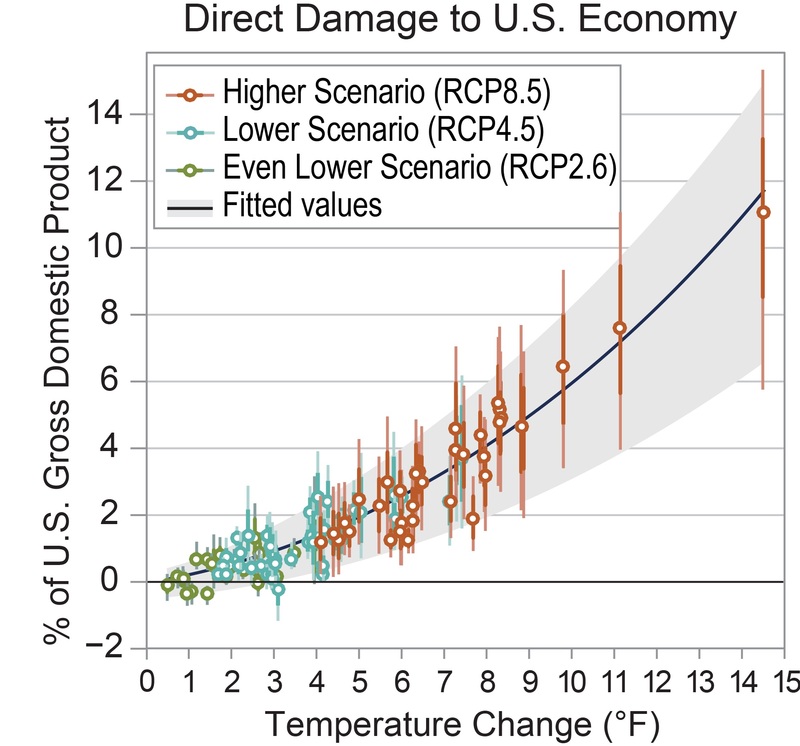 What I’m discussing in the post is how seriously we can take an economic analysis that suggests a relatively small impact to GDP even for a level of warming that is on the tail of what is expected for RCP8.5. This impact would seem implausible low for this level of warming, but maybe there are reason why it’s not. I believe that the 10% figure is based on gross economic activity in key sectors similar to those measured from the federal reserve bank reports. They do not include costs of catastrophic impact events, societal stressors of regional resource depletion/habitability losses, adaption costs due to migration or the impacts of increased wars regionally and globally. If you look at the projected midwest grain yield projections in the report under the “10%” scenario you find that the reductions of wheat, soy and corn yields alone at 8C of warming would produce domestic famine. So, basically the 10% economic activity impact is nonsense. I think you’re right, aTTP, to question how 8C of warming would produce such a small reduction in GDP. I’m imagining the mass migrations that would be produced from the tropics to more temperate areas; and the movement inland of the 60% of the world’s coastal populations. Add to that the constant bombardment of extreme weather events worse than Katrina, Sandy, Harvey and Paradise occurring every year. Then again maybe the economists are thinking the millions of people losing everything and then struggling to relocate and rebuild their lives and homes creates a net benefit to GDP? The again, maybe GDP is irrelevant when predicting overall human well being? Rebuilding after a disaster boosts GDP. So there’s that. It’s worth remembering that an economic depression combined with a ill-timed drought was sufficient to create thousands of migrants within the relatively well-off United States of America during the 1930s. The movement changed them; the highways, the camps along the road, the fear of hunger and the hunger itself, changed them. The children without dinner changed them, the endless moving changed them. They were migrants. And the hostility changed them, welded them, united them—hostility that made the little towns group and arm as though to repel an invader, squads with pick handles, clerks and storekeepers with shotguns, guarding the world against their own people. In the West there was panic when the migrants multiplied on the highways. Men of property were terrified for their property. Men who had never been hungry saw the eyes of the hungry. Men who had never wanted anything very much saw the flare of want in the eyes of the migrants. And the men of the towns and of the soft suburban country gathered to defend themselves; and they reassured themselves that they were good and the invaders bad, as a man must do before he fights. They said, These goddamned Okies are dirty and ignorant. They’re degenerate, sexual maniacs. Those goddamned Okies are thieves. They’ll steal anything. They’ve got no sense of property rights. And the latter was true, for how can a man without property know the ache of ownership? And the defending people said, They bring disease, they’re filthy. We can’t have them in the schools. They’re strangers. How’d you like to have your sister go out with one of ’em? The local people whipped themselves into a mold of cruelty. Then they formed units, squads, and armed them—armed them with clubs, with gas, with guns. We own the country. We can’t let these Okies get out of hand. And the men who were armed did not own the land, but they thought they did. And the clerks who drilled at night owned nothing, and the little storekeepers possessed only a drawerful of debts. But even a debt is something, even a job is something. The clerk thought, I get fifteen dollars a week. S’pose a goddamn Okie would work for twelve? And the little storekeeper thought, How could I compete with a debtless man? And the migrants streamed in on the highways and their hunger was in their eyes, and their need was in their eyes. They had no argument, no system, nothing but their numbers and their needs. It will take far, far less than 8 C of warming to unleash Mothra. I’m sure we’ll get it. I too would be interested to learn more about how ~8C would only impact US GDP by 10%. I find this flatly implausible, so obviously I am missing key details of the analysis. Or the analysis is missing key details of the ecological impact of 8C by 2100. Economist compute every hazard separately then simply add up the result. They dont compute what happens when impacts are simultaneous multiplying the effects. Suggest to me that perhaps GDP doesn’t accurately reflect our actual values. Even if it would be economically less costly to redistribute the population of the areas affected (I’m assuming the plan isn’t to let them die), does the GDP gain/lack-of-loss adequately compensate those who have lost their home(land)? Agreed. This degree of warning would destroy every habitat on earth. Stockholm in this future would be warmer than St Tropez is today. I am not a climate economist or anything of that sort. But as far as I read so far, desasters like hurricanes in some way also boost GDP under certain circumstances, because rebuilding all the damages stuff also contributes to GDP. But IMO this misses one thing: The loss of capital. So if your house is destroyed by a hurricane, you will build a new house, boosting local economy. But on the other hand you lost a lot of money and you can’t build a new house every few years, because you simply don’t have the money for that. But with that 8°C warming, I think this kind of thinking is flawed in general, because this won’t apply IMO to that level of warming. There will be lots of areas, that are already hot, that will then simply not be suitable for living anymore, especially in poor countries. 8°C will mean that sea level rise will go through the roof, so low lying areas where many people live, will also have to be abandoned. Or think of what an only 4°C ocean would mean for hurricane/typhoon strenghts. Kathrina will look like a minor storm compared to that and many countries affected by those desasters will not be able to cope with that. So you will inevitably get *major* migration flows all around the world. And those people will wanna go to areas that are still livable. But unfortunately there are already people living there, that do not want to share their land with those other peoples of such a huge quantity. Just look what effects the Syrian migration crisis had on Europe, where a population of 500 million faces about 2-3 million migrants/refugees and many people in those countries went nuts, even if those refugees where only 0,5% of the population. Or just think of the few thousand migrants currently on the way to the US in Mexico. And now imagine that there will be tens or even hundreds of million people on the move (which there will be in a 8°C warmed world), and they will be much more desperate. IMO this will inevitably lead to a big tensions in societies, civil wars or even bigger wars over land/resources/water/etc, throughout the world and I can’t imagine, that this will not lead to a global recession. People fighting for their survival don’t eat at McDonalds, don’t drive Teslas or buying Microsoft Office or iPhones. An 8°C warmer world will be a totally different planet. You would loose nearly all glaciers, many now hot areas like Southern Europe, Texas, many parts of Latin America, will be not suited to sustain live as we know it now at those places. the rate of economic growth” variety. There is exactly one hit for “GDP”, and six for “gross domestic product”. Much of what is discussed includes commentary of the paucity of relevant economic literature for the sector/region under study, and even more so on how these impacts might interact in the overall economy. But even where they get into some nitty-gritty, I am just slack-jawed at some of the conclusions. That first assessment concludes that the economic damage from wildfires will be decreased by about $100 million/year under RCP8.5 in 2090. And RCP8.5 will have less damage than RCP4.5. (This happy outcome is “owing to projected landscape-scale shifts to vegetation with longer fire return intervals”, which seems to suggest that much of the entire wildfire-susceptible part of the nation gets burned to the ground in the meantime to make way for new ecosystems.). Anyway, what’s not to like about this? Who needs mitigation if we get these kinds of benefits to doing nothing? The second conclusion stuns me even more. Economic damages to agriculture are a piddling ~ $12 million/year under RCP8.5 in 2090, and if we go hard on mitigation and achieve the RCP4.5 outcome, we could avoid about $1 million/year of that. Which, again, just seems to be an invitation to do nothing or very little. Frankly, to me, these numbers just beggar belief, and seem inconsistent even with emerging evidence in real-time. It seems to me economic models are quite suspect overall given their lack of skill at predicting next year’s GDP much less GDP in 10 years. The problem here is that human culture is an adaptive thing and there are lots of ingenious ways to overcome obstacles and limitations. More important is exactly how improbable an 8 degree C increase in temperature is. If we take TCR to be about 2, it requires (on my back of the envelop calculation) CO2 of 4480 PPM and I expect there is no path to get there absent a series of super volcano eruptions. If TCR is 1.3-1.4 as observationally constrained estimates indicate, literally tens of thousands of PPM’s are needed. A super volcano eruption that causes massive crop failures for several years in a row is said to be by geologists on roughly the same scale of likelihood (I keep hearing Yellowstone is overdue). Thus, the question is how could such a scenario make it into a report that was presumably reviewed by someone with at last some expertise? As I am ASSUMING that this blog post and the 2017 paper referenced here, can be located in the FULL Volume II of NCA4. Because Volume I of the NCA4 is s-o-o-o-o-o-o-o-o-o last year. Seriously clean up your act and provide actual links to NCA4 sections that you appear to be complaining about. This blog post needs links and a proper context. Hey EFS_Junior thanks for the link. Seems like dogma to me. It would be more productive to find flaws in the economic models or integrated assessment models used to assess damages. Find the flaws, correct them, and determine what the change in the damage function is. “Supplementary Figure S14: Estimating different functional forms for expected total direct damage. “This response is well approximated by a quadratic function (fig. S14) that is highly statistically significant for changes above 1°C (P < 0.001) (table S16)." WOW! Make several dozen econometric (or some such) assumptions then fit several polynomials (3rd (-0.00901) and 4th (-0.00697) have negative slopes (going concave down mind you) at their end points), pick the only non-linear one that has some sort of proper upper boundary (concave up), declare victory at p < 0.001 (Seriously!!!) from modelling assumptions mind you. (insert bug eyed and rolling eyes emoticons here). I want the raw data used in Supplementary Figure S14 so that I can fit an exponential curve fit that has a higher R^2 and narrower confidence intervals that their “so called” parsimonious quadratic fit. It’s called p-hacking. But n-o-o-o-o-o-o-o-o, the authors can’t be bothered to plot the raw data with their polynomial curve fits. So much for the “so called” scientific method. Kind of reminds me of another curve fitting paper circa 2016/2017 (doubling times and hosing). “a headline figure that following a high-emission pathway could reduce GDP by 10%. On a more sober note has any economist concluded what the effect on GDP of the dramatic reductions required to avert global warming are. Shipping reduced. Cars reduced. Factory production reduced. Mining royalties reduced. We are not talking a minute reduction here. We are talking all out major scale depression if mitigation is introduced and widely accepted. Figures of 40-60% reduction would easily spring to mind in a couple of years. I do not know if you guys have superannuation or shares but I would seriously have a look at the effect on yourselves, your husband’s or wives and children. GDP depends on the energy running, fairly flat out. I think ATTP is right in his comments on the scale if nothing is done. Why can no one see or admit the much worse converse. I cannot eat solar energy. Yes, I realise it probably seems like that to you. What I’m saying is that an 8C rise in global temperature will substantially change our climate and it seems remarkable that an economic analysis implies only a 10% reduction in (US) GDP. If you want to provide some explanation as to how we could be confident in it being that low, do go ahead. This result is on the tail of the RCP8.5 distribution. It’s not some new scenario. If you look at the figure in the post, most of the results for this RCP are clustered around a much lower level of warming. There is a single point at ~15F, which is on the tail of the distribution. It’s very unlikely, but not impossible. …when it comes to the damage function, we know virtually nothing—there is no theory and are no data that we can draw from.3 As a result, developers of IAMs have little choice but to specify what are essentially arbitrary functional forms and corresponding parameter values. This type of modelling is of highly questionable value at all. As is amply shown by this report – essentially an reductio ad absurdum – that climate change at a level which will devastate every ecosystem on earth will have very little impact on GDP. I call absurdum. A super volcano eruption that causes massive crop failures for several years in a row is said to be by geologists on roughly the same scale of likelihood (I keep hearing Yellowstone is overdue). Who’s telling you about Yellowstone dpy? Geologists or someone on wattsuppia? Not any geologists I know, that’s for sure. Don’t say Ian Plimer or I’ll spill my coffee. angech brought that up a few months ago and I looked into the recent literature. Yellowstone has far too small a melt fraction in its magma chamber. And too small a melt volume to yield an eruption on the scale of the historic ones that concerned people. Long Valley is closer, and gives some support to the Yellowstone results. Using the same techniques, Long Valley has about double the melt fraction as Yellowstone. If they’re both out by a factor of two, Yellowstone could be closer to critical, but Long Valley would have already blown. (This is stuff I know about because the critical melt fraction for magma expulsion is something I worked on as part of my PhD.) And none of the historic super-volcanoes caused major let alone mass extinctions. OTOH 8C warming events did. Even 4C warming events did. Much smaller impact, much lower likelihood (in the order of one per million years). Risk = likelihood times impact. RCP8.5’s likelihood is vastly greater than one in a million. We’ve hardly deviated from it so far, and there’s a billion-dollar PR industry dedicated to keeping us on RCP8.5. I’d put it at least at one in ten. And 8C would genuinely be catastrophic, based on the geological record. The rest is just arithmetic. And why TCR? And why 2? Why not ECS, and why not 3-and-a-bit, which is where all the recent research is pointing? Indeed why not something at the higher end of the IPCC range? If you have to play Russian Roulette, the smart player puts one slug in the gun, not five. Only if we cancel such activities angech, which no-one serious is proposing, as opposed to making them less polluting, which they are. I believe one of the beauties of GDP is that a scrappage scheme and accelerated introduction of electric cars would increase GDP. Like rebuilding after a disaster. Although I’ve never quite sussed that one: even I have heard about the Parable of the broken window. And I don’t think royalties count, that’s just moving money around. We are talking all out major scale depression if mitigation is introduced and widely accepted. Figures of 40-60% reduction would easily spring to mind in a couple of years. Don’t be silly angech. It weakens your argument. Angech worries about a depression if serious mitigation measures are made to reduce GHG emissions. Let us put this rather fatuous comment into perspective . Professor John Schullnhuber, one of the world’s leading climate scientists at Potsdam, said that the difference between 2 degrees of warming and four degrees of warming is ‘human civilization’. In other words, on the current trajectory, human civilization is already teetering on the brink. Once we pass the 2 degree threshold, we are going to have a lot more to worry about as a species than a recession or a depression, as ecosystems begin collapsing around us. Our dependence on nature and ecolopgical services is virtually absolute. The material economy is inexorably connected to the health of the natural economy. Yet this belief persists that we are somehow exempt from the laws of nature, that preventing warming is a ‘luxury’ and that preventing ecological collapse is not a necessity. It is utter insanity. Interesting. So, if I have it right, there is fewer US wildfire damage projected under RCP8.5 because deforestation occurs in the susceptible Western US region. Whereas deforestation is halted under RCP4.5, so more wildfire damage? The big problem with this is that it misunderstands the RCP framework, and assumes that deforestation is a necessary part of a RCP8.5 pathway. There is more deforestation under the particular scenario used to generate RCP8.5 emissions for modelling but, as as far as I’m aware, there is no reason to assume deforestation is a necessary part of an RCP8.5 level future. So recessions and depressions npw are not a problem? We will not be here when 4C warming comes, if it comes. I only have one life, getting shorter and I want to enjoy it. There is no way to avoid massive recession if mitigation on the scale and immediacy needed is to occur. Better to hope skeptics have some chance of being right and if not pretend they might have it right. there is no reason to assume deforestation is a necessary part of an RCP8.5 level future. Under a global warming of 8C, I expect most trees at current latitudes cannot survive, so there won’t be any forests. That’s one way to reduce wildfire incidents. That future is already here paul. A third of the Klamath Forest is now climatically a chaparral biome. It’s only inertia (the moisture and soil retention and shade provided by the existing forest), and human forest management that has favoured confer dominance by suppressing fire, that’s keeping it as forest. When it’s gone (due to a catastrophic fire or clear-felling), it’s gone – it won’t regrow naturally. That links also to another reason why linear perturbations calibrated to short-term events are likely to future climate impacts. As well as being non-linear (or non-quadratic, or whatever), future damage functions will differ from past damage functions in that they’ll be sustained for decades or centuries. They’re the new normal, not perturbations. A thirty-year drought will cause more damage than ten three-year droughts with a decade or two recovery in between. Places which are already out of equilibrium will have zero damage until the next big fire. Then they’ll have infinite damage – not just 100% (the resource value times the thirty years or whatever it takes to regrow) – they’ll never grow back. When it comes to humans dying in city heatwaves, IIRC it’s when you get three or four days or a week above a certain night-time temperature that mortality skyrockets. You can’t calculate that by multiplying the causalities from a one-night heatwave by five. A flood that doesn’t over-top the flood barrier will have zero damage until over-tops. Etc. Hsiang etal report GDP% vs temperature rise not GDP vs year. 8C rise from RCP8.5 is the central estimate reported in AR5 at 2300 so I’m guessing Hsiang ran their model across that range. The NCA authors used the figure from Hsiang, took the GDP number off the graph, and (I’m guessing) inadvertently took the range to be RCP8.5 at 2100. Cost/benefit is a (disappointingly) small bit of the report, but unfortunately I expect this error will be sufficient to discredit the report in its entirety by those so inclined to do so. I’d agree also that the growth rate of GDP at higher temperatures feels implausibly slow. At 8C rise I’d expect Canada would be building a wall to keep the Texans out. This ‘proper’ British critique – and the comments (thus far) – and other reporting (& lack thereof ) has me doing some game theory speculating. To what degree might 45’s much ballyhooed “I don’t believe it” strategically compliment an intentional effort to focus this National Assessment on an [all-but-an-almost-irrelevant] ‘outlier’ (thought Mark B’s 2300 ‘mistake’ is plausible, &/or strategic) … among 45’s political base? To the degree physics has been propagandize to be subjective: 1. This Assessment is already dismissed. 2. Any observable scientific controversy about it will be felt [by 45’s base’s motivated reasoning] to be further proof that ‘TheScience’ isn’t settled. 3. Part of a contrarian leveraging of science and the Green New Deal effort to effect a generational divide within the Democratic Party. 4. A further energizing and potentially affecting of a minority-based re-selection of overt political/economic resistance to science-based climate policy. 5. Hedge this bet by laying the groundwork for a subsequent reboot of ‘covert’-via-lip-service-lies approach … or a making sure that economics [continues to] trump physics. Meanwhile, tic, tic, tic … until 6. its [the inevitable] geo-engineering time!?! Hugely brilliant … if intentional, i.e., an across-the-pond bolloxed ballyhooed tally-ho dictated by our Wall Street and your Square Mile … and the politicians we deserve. But Occam’s razor suggests all this is simply our shared motivated reasoning concerning GREED-as-god; wealth and freedom being the right to be irresponsible. Dot-whiskers indicate the distribution of direct damages in 2080 to 2099 (averaged) for multiple realizations of each combination of climate models and scenario projection (dot, median; dark line, inner 66% credible interval; medium line, inner 90%; light line, inner 95%). If you look at Figure 1A from Hsiang et al. it shows the modeled temperature change distribution considered by their analysis, and it shows that the temperature change they’re talking about is up to 2080-2099. And you can see at the tail end there are models producing 8ºC warming by 2080-2099. The distribution comes from this paper (Rasmussen et al. 2016). So the NCA report is correctly representing the study. Mark B, at an 8 degree C rise we are in the final throes of our own extinction. The planet will be literally hell on Earth. Estimates are that intense volcanic activity at the end of the Permian caused atmospheric concentrations of C02 to rise to about 2,000 ppm. This generated a temperature rise of around 8 degrees that elapsed over around 10,000 years, but was enough to wipe out over 75% of species on land and 95% in the oceans. Building walls will be the last of our problems if indeed surface temperatures rise 8 degrees in 1% of the time it took to cause the greatest mass extinction in our planet’s history, often referred to as ‘The great dying’. Greg Robie’s political suspicions about a government report that picks a high-end number for temperature rise (with the implication that reality will be lower) and a low-ball number for economic damage may be justified. On the other hand if they had ignored the worst case extreme projection that might have been seen as cherry-picking too. As vtg points out economic modelling of damage from any change is woeful and makes climate modelling look a paradigm of skilfulness by comparison. To give some credit to the report it does acknowledge this problem. The damage is reported as ‘direct’ damage. but as chapter 17 describes, there are interactions between those direct damages and other material and institutional social systems that are independent of climate, but susceptible to indirect effects from impacts on other aspects. The potential for malign synergistic deterioration is at least recognised, the ‘Seneca Cliff’ effect, but the mantra of more research is invoked rather than apply it to the low-ball economic damage figures to make them a little more credible. At 8C rise I’d expect Canada would be building a wall to keep the Texans out. We don’t need no stinkin’ wall to keep Texans out. We use different money, have national health-care, and all our road signage is metric. The 800 kg gorilla in the USA GDP room is to guesstimate … wait for it … USA GDP in 2100 to better than 10% accuracy (I’d say 1% but that requires three significant digits of accuracy from a leading order of magnitude guesstimate). The logic here is so completely and clearly circular. The current USA GDP is very approximately $20 trillion ($2E+13, or will be in 2018, my guesstimate from 2017 GDP end point and three quarters of published 2018 GDP)). Doing the p-hacking thing, a quadratic fit has an R^2 = 0.998 (1960-2017 inclusive, data as is), while a shifted (adding $4.56E+12 constant to all 1960-2017 $ inclusive) exponential at 3% growth has an R^2 = 0.989. But do your own thing as YMMV. So, in this admittedly overly simplistic exercise, I can’t even get the 1st significant digit right (right in the sense of a very rough cut guesstimate). Now, let’s use that 10% GDP growth reduction number (in 2100 for my purposes) and 82 years of continuous (exponential) compounding (2100 – 2018), to get the per annum compounding coefficient, that turns out to be approximately 0.128% per annum (e. g. ~1/1.00128^82 = 0.90 (or 10% decrease)). A change in GDP growth of just -0.128% per annum! Bottom line, no one can guesstimate USA GDP in 2100 (today) to even begin to see a “so called” 10% reduction in the actual GDP number that will occur in 2100. Do you even see that circular logic? Who will be the cumulative climate damages CPA’s between now and 2100? Hopefully neither deniers or alarmists. Jeffh, it’s also about where we got to during the Carnian Pluvial Event and the PETM. There was 3-4C of rapid warming, on top of a baseline that was maybe the same again, but it’s easier to measure the rapid increase accurately than the baseline, where there may be long-term drift in the proxies (in the same way as we can measure temperature anomalies more accurately than absolute temperatures). If folks don’t know what pluvial means, look it up. In both cases the hydrological cycle was supercharged, with much, much more intense rainfall (good ol’ Clausius-Clapeyron); in the PETM at least, interspersed with multi-decade droughts. In both cases we know it wasn’t just special cases where the land record is preserved, because it changed so much that the deep oceans recorded clay-mineral and trace-element anomalies demonstrating that weathering, soil-forming and erosional processes were fundamentally different across the globe. It was, literally, a whole different world. One where anything remotely resembling modern agriculture would be impossible across much of the globe. Modern cities too, in places (no rain for thirty years, then a storm which rolls car-sized boulders 100 km). 10% of GDP loss from that is just silly. It did have its upsides. The CPE is what kick-started the diversification of the dinosaurs. All those empty niches to move into. So we can thank it for some cool movies, documentaries and museum exhibits. And the diversification of the primates dates to just after the PETM. There are always winners from environmental catastrophes. It’s usually not the previous top dog though. If you want to borrow trouble, ponder whether it was more important that it got to 8C, or more important that there was a really fast 3-4C rise, in a non-icehouse world which had seen only very slow change for millions of years. BTW, I’m beginning to wonder now if the Great Dying was a double-whammy, like the end-Ordovician. Recent dating has tied the first of its two closely-spaced extinctions to abrupt cooling, probably due to volcanic aerosols, followed by warming as the aerosols rained out and the CO2 stayed in the atmosphere. The first one got the warm-adapted critters, and the second culled the cold-adapted survivors. So only the real toughies made it though. It may have been even warmer in the early Triassic, when the equatorial regions were too hot for reptiles and fish. So even the heat-tolerant toughies fled to higher latitudes. A recent paper identified a sharp relative sea-level fall at end-Permian, which they attributed to a brief glaciation. It would make sense as a Large Igneous Province was probably the cause, and an ice age or “nuclear winter”, followed by a hothouse, is a logical outcome. Forgot to add, we are of course creating our own double-whammy – jumping from a period when life has adapted to glacials and interglacials, into a hothouse (some define that just as ice-free poles, well below 8C, because that where the hysteresis loop or bifurcation kicks in, but 8C would be a hothouse by any definition). And I was rejigging the last paragraph when I hit Post 😦 . The early Triassic bit should, of course, be at the end. Paulskio: The distribution comes from this paper (Rasmussen et al. 2016). Thanks for that. I should have looked at the paper more carefully. The way in which life adapted to glacials and interglacials was to undergo a rapid wave of extinction of the land mega fauna at higher latitudes as plant production shrank. What is left is a much pruned bush of the pre-glacial mammal, reptile and avian diversity. The major factor that shapes biodiversity of animals is the primary plant production. As it is estimated that humans now corner around a third of that production there is little opportunity for any increase in diversity. In a hot-house with reduced plant production and human adaption to avoid starvation it seems likely that further constrains on animal diversity will be imposed. Beyond the replacement of so many wild species with domesticated food animals and plants. Of course izen. The next adaptive radiation will be after human civilisation collapses. Or follows Elon Musk into space. Cockroaches perhaps, or rats. Although I doubt if anyone would have predicted dinosaurs or primates at the time, so probably something else. Our extensive monocultures may be an advantage. Huge empty niches, ripe for exploitation once they collapse. Unless we do something to forestall it, of course. I’m of the view that we killed off the megafauna, either directly by hunting and habitat destruction or indirectly by putting fields where they previously migrated to. They didn’t adapt to previous interglacials by dying out. They survived in large or small refugia and recolonised the glacial steppe in the next glacial. And Australia, with a completely different climate and timing, is a telling pointer for Occam’s Razor. We didn’t have to completely wipe them out. Just reduce their numbers and connectivity to the point of an unsurvivable genetic bottleneck. The refugium was too small to support a viable population. Excess of genomic defects in a woolly mammoth on Wrangel island. We barely made it through our bottleneck. Apparently there are “ghost” lineages in Africa that didn’t. Probably not our fault, just the luck of the draw. We probably did for the Neanderthals and Denisovans the same way though. When you think about it, humans in energetic terms are equivalent to the megafauna. Slow breeding, and requiring a large home range to support a small population (in our wild days), due to our energy-hungry brains and meat-eating habits. At the Santa Fe Institute Cowan soon invited Reed and a few of his key staffers to Santa Fe to meet with a key economists and scientists in a brainstorming session on international finance as a complex system. In August 1986, after a daylong discussion of the complexities of financial markets, Reed agreed to fund a workshop on “The Economy as an Evolving Adaptive System,” to be led by Phil Anderson and Kenneth Arrow, both Nobel laureates and both involved in the new Institute. The workshop brought ten leading economists together with ten Institute scientists for two weeks of talks and discussions. Following the workshop, Reed committed $1 million over four years to support a new complexity economics program at SFI, to be led by Arrow’s Stanford economics colleague W. Brian Arthur, who later became SFI’s first resident fellow. …. erratum: “him” refers to PWA (95 in two weeks), not Paulsen! We have focused on the U.S. economy, although the bulk of the economic damage from climate change will be borne outside of the United States (42), and impacts outside the United States will have indirect effects on the United States through trade, migration, and possibly other channels. The US economy isn’t isolated in the world. I think the focus on the 10% figure has been rather unfortunate. It seems like we have to put everything in terms of dollars, nevermind the loss of life, quality of life, biodiversity, etc. that we apparently don’t care about. I love the work of Phil Anderson. People who did not have a look at complexity economics yet will be well rewarded by having a look at the above links. To understand things you need to simplify, but capturing an entire economy in just a few number like classical macro economics does, ignoring the spatial structure, networks of trust, and diversity/variability seems to me a too big simplification. But then, I was trained as an arrogant physicist. Computing aggregate damages for a small number of problems does not sound like a good idea to me. That is similar to computing sea level rise, while leaving out the contribution of the collapse of the ice caps. Because it sounds like a total such a number will be abused. To be honest, I do not care how likely RCP8.5 is. I would love to know how people define probabilities in such cases; until then I will consider such probability estimates cheap hand waving. That the group who is fighting to make RCP8.5 or worse a reality complains about people studying that scenario is one of the most bizarre parts of the climate branch of the US culture war. Scenarios are just that, scenarios and we need to know the consequences of listening to people like -1 or Donald Trump. If anything we should have a scenario that is significantly worse than RCP8.5. Trump has promised to bring back coal. Similar authoritarian regimes are popping up all over the world, they like seeing the people below them suffer and they tend to start wars. If Trump wins we will be in a world of trouble and oligarchs are funding authoritarians all over the world. We are lucky Trump is a loser, incompetent, lazy, old and unhealthy, but will we be that lucky for the next century? It is unlikely we could return to a hunter gatherer lifestyle, wild game is now only available where efforts are made to preserve it for ‘sport’. Nearly all the meat is now contained in a few domesticated species of cows, pigs, and chickens. Large carnivores that could pray on humans are unlikely to survive in a much warmer world. It’s the pathogens and their insect vectors that are a bigger threat. Whatever human population survives a global collapse will be back on local agriculture of whatever domesticated (or GMed) plants or animals survive. In a warmer, wetter and CO2 enhanced World, wood may be a viable fuel option. Until the industrial revolution wood was the main fuel, and the Taiga will be expanding. Fast growing poplar, and eucalyptus hybrids offer advantages, but would be competing for space with food crops. The utility of plastic, and the relative simplicity of the technology required to recycle it, may mean that mining rights become valuable on pre-millennial landfill sites near urban centres. I would not absolve humans from all blame, but I suspect human expansion was as much an effect from the changes that were killing off the mammalian megafauna, as a cause of that die-back. The razor of human culpability does not seem to cut it when it comes to explaining the similar contraction in species, genera and families of whales and dolphins. There used to be thousands, now there are 89. African Plio-Pleistocene megafaunal extinctions look likely to be climate change in Africa, but the late Quaternary die-offs are probably more down to us than falling CO2 and orbital dynamics. Why the insistence on critiquing the evaluation of climate damage in monetary terms? It’s a nonsense, especially, as Dana points out, if it is regionalised economy being measured in response to global impacts. We may not be certain where the game-changing warming point is precisely, but for sure it’s a long way south of 8 degrees. The media likes to focus on money because their consumers understand becoming richer or poorer, and the angst and hope associated with these, but it’s a weak metric for the shitstorm heading our way, really. You all know this. Energy towers? As a part of the current balancing of energy demand, for much of the time, large amounts of energy capacity are left idle for economic reasons – power utilities find the needed resources on on best-price basis. As a result, there is often capacity sitting idle – it has been paid for already but is not getting used. This capacity could be realised at very low cost through the production of hydrogen from renewable sources (solar, wind and hydro) and storage for later use. Note, the UK is already a net importer of Hydrogen, and the entire market is controlled by just two companies. The capacity to generate, store and distribute it in a cost-effective manner already exists (check out the Munich-Modena ‘green corridor’), the ambition is there (Japan’s 2020 Olympics is to be entirely H-powered), and someone in the UK has noticed that introducing h-powered trains saves a lot of money on infrastructure improvements (ie, electrification) and is net cheaper – Several companies already produce working systems for this. We can already produce, store, distribute and use a lot of energy from properly renewable sources without compromising or reinventing the wheel. We just need to do it more. Does anyone think that the millions/billions of hungry people displaced and disenfranchised by CC in Africa, Asia and Latin America are just going to conveniently lay down and die? Do we want them to? The zombie apocalypse is a little out – but an unimaginably vast movement of very hungry, angry people could yet start and make ‘comfortable civilisation’ look very vulnerable. Since you mention it, HyTech’s Scaleable Energy Storage (SES) is an interesting development. Maybe more interesting that energy towers, ultimately, if it works as advertised. TomF – “mitigation and adaption contribute to GDP”. Yes, but so do efforts to develop non-fossil alternatives. In hindsight, the economic messaging in this report wasn’t very effective. Instead of trying to quantify damages, which is a fools errand. Should have focused on economic competitiveness. In 2050, when global temps are approaching the critical 2C threshold, we will be offering the world coal and other fossil fuels while the Chinese offer solar and EVs. Hi Chubbs, I hope renewables continue to contribute to GDP. However, I also want their cost to continue to decrease. I hope we get started quickly. Fergus, would you please provide some illustrative links for your suggestions about hydrogen? As a starter, have a look at the link in my comment just below Fergus’s. And just google up ‘hydrogen economy’. The main problem with hydrogen is EROEI, but using ‘spare’ W&S overproduction to power the electrolysis and better storage chemistry (eg. SES) might just change that game, at least somewhat. Thanks BBD! I don’t know why I didn’t see that … my bad. No worries, Susan. Easily done. I am more worried about the 1.5C warming cost estimate. Greenland and Antarctica @1.5C warming below. At least where I work in the government, part of the tactic to push an agenda through is to dump massive amounts of technical jargon to silence the opposition, in my case, economic analyses or resource assessments of offshore oil and gas. When a federal court or board reviews such an analysis, unless it is shown to be dramatically arbitrary or capricious, the reviewing entities are compelled to deffer to the government technical experts. IMO, throwing down tons of seemingly highly technical data and analyses is a tactic to make the document appear more defensible, even when it’s full of highly subjective assumptions or technical errors; It’s just too difficult to for challengers to win that battle. In our world, it’s mostly about winning over truth because pleasure usually trumps truth. The decision had been made before they drafted this report to show negligible economic damages with increased GHG emissions. Showing that global warming is a serious threat to our GDP or preservation of life or happiness was never a possibility. BBD, Susan: Here’s an ongoing example: http://www.h2-suedtirol.com/en/ . I visited. The Director is convinced that equivalent cost will end up around $0.04 . On the down side, their high-pressure compressors are scary-powerful and not cheap to run. “Elsewhere, the Tokyo Organising Committee sees the games as a testing ground for Japan’s long-term goal of realizing a “hydrogen society.” Although Tesla founder Elon Musk may have dismissed hydrogen fuel cells as inefficient and expensive, companies such as Toyota Motor Corp. and other leading Japanese manufacturers are betting on hydrogen as the wave of the future for sustainable and clean technology.